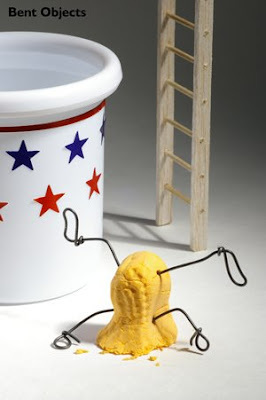 Another tragedy at the Circus Peanut Circus. I was invited to be in a group show at a gallery downtown (Indianapolis). Everyone got one large piece of paper to work with. You could do anything you wanted with it- paint, draw, origami, whatever. I procrastinated for 3 months or so, and then yesterday I made this, because I have to drop it off today. 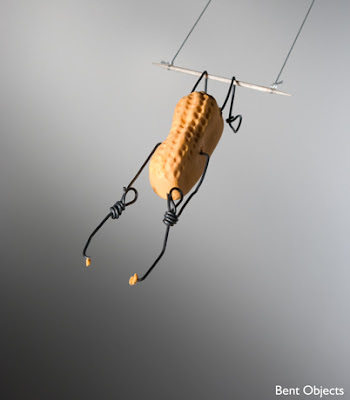 I call it "How to catch a paper tiger"
Yes, it's Strangely Orange Snack Appreciation Day! All those months agoI decided to invent my own holiday, and now it's finally here. It's been weirdly strange and fun, I encourage everyone to start their own special day. I'm all for HOLIDAY ANARCHY! I mean- who invented Sweetest Day? We already have Valentines for pity sake! Sweet Potato Pancakes (I've yet to get the middle of them done as much as I'd like). If anyone else would like to share your holiday activities of whatever orange sort, I've decided to direct you to here, the S.O.S.A.D. event page of Facebook. Upload those photos for all the other attendees to see! I'll be uploading there throughout the day. Now I'm off to have some orange tea. Cheerio! 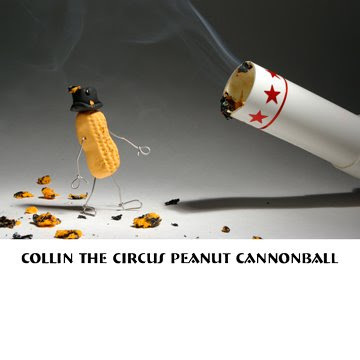 Yeah, haven't settled on an idea for the ice cube yet, so here's the latest installment on the ever tragic Circus Peanut Circus. 23rd annual Nominate An Object To Use Event! It's been a long time since we've done this. This is your chance to name an object for me to use in a shot. Mention your one (1) object (spork, lemon, etc. And by the way, these two have been done already), then mention an object that someone else has already named. This way, we get a sort of voting process going on. I'll tally the votes Saturday at 9:00 E.S.T. in the U.S.
One more thing. I'm holding a little give-away. The first five people to send me an image of themselves eating an orange snack each get a Mini Strangely Orange Snack Day Button. (Warning- I'll probably post them!). Be sure to include your address with your picture!